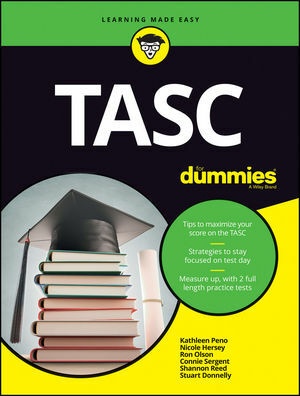 The TASC Math exam will likely contain some questions where you’ll have to confront radicals. Don’t worry—it’s not as scary as it sounds. You can just think of radicals as the “opposite” operation of applying exponents. Note that if the index of the radical is not explicitly written, then you assume it’s the square root, so the index is 2. It’s important to remember perfect squares. You should probably know up to 12 at least, if not 15. Make a factor tree (go to the primes, meaning you can’t break the number down anymore). Find pairs (square root), triples (cubed root), and so on. Write pairs outside the radical (write only once) and leave everything else inside (think of the pairs as friends going out to play). Find the products of what you “pulled out” and left behind. To solve this type of problem, you can substitute each of the choices in for x and solve or you can rewrite the original problem to be in the same base. Because the right side of the equation is a fraction, you know that its exponent is going to be negative: 3x = 27–1. Now you can rewrite 27 in base 3: 3x = (33)–1 = 3–3. This means that x = –3, Choice (B). When combining radicals, you first have to check that the radicands (the expression under the radical symbol) are the same. Because they are in this problem, you add the two coefficients together and leave the radicands alone, which results in Choice (C).